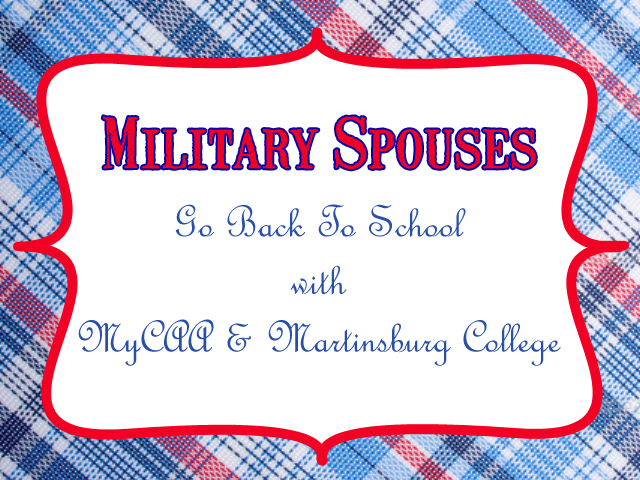 ** A big thanks to Martinsburg College for sponsoring today's post. All thoughts are my own. As military wives, we seem to have every excuse NOT to further our education and our careers, don't we? My husband's schedule is too unpredictable to plan classes. We could move at any time, and then I'd just have to start over. Finding a job as a military spouse is hard! Who wants to hire someone who will just move soon? And do I really want to start all over with a new job when that time comes? College expenses on a military paycheck? It's just NOT in the budget. Be honest, how many of us have said at least one of these? I know I certainly have! I could never imagine that as a busy mom with a military income that furthering my education was really an option. Unpredictable schedules and financial strain are certainly valid reasons... but what if I told you that they don't have to be? What if there was a way that you could save money on college AND a college that works with you and your unpredictable military life? Great news! With MyCAA and Martinsburg College, there is!! MyCAA - or the Military Spouse Career Advancement Accounts - is a scholarship program that provides up to $4000 (over 2 years) of financial aid to eligible military spouses who are pursuing degree programs, licenses or credentials leading to employment in portable career fields. MyCAA Financial Assistance pays tuition for education and training courses, and licensing/ credentialing fees. This includes state certifications for teachers, medical professionals and other occupations requiring recognized certifications; licensing exams and related prep courses; Continuing Education Unit (CEU) classes including those offered through professional associations; and degree programs leading to employment in Portable Career Fields. MyCAA also pays for High School Completion courses, GED tests and English as a Second Language (ESL) classes. MyCAA is available to the spouses of active duty service members who are E1-E5, W1-W2, and O1-O2. Spouses of activated Guard and Reserve members with these ranks are also eligible, but must be able to start and complete their courses while their sponsor is on Title 10 orders. Eligible spouses can establish a MyCAA Account by visiting the MyCAA website. Now that the money is taken care of, it's time to choose the right school to fit your needs. And for the military spouse that can certainly be tricky. The only thing consistent for the military spouse is inconsistency. We can up and move at the drop of a hat, and we need a college that will suit that life. Martinsburg College is an ideal choice. They understand the unique needs and challenges the military life brings and work to make it easier for both service members and their families to get the education they deserve. What program options are available from Martinsburg College? Martinsburg College offers a variety of certificate options that are ideal for military spouses such as opportunities in Healthcare, Medical Administration, Security, Business and Professional Development, Information Technology and Digital Technology Integration. Military spouses can consider careers such as pharmacy technicians or medical administrators that are available no matter where the military takes them. So, why choose Martinsburg College? What sets it apart from the rest? So, now that you've heard all about how MyCAA and Martinsburg College can help you get a great career that is military friendly and affordable...what are you waiting for!? Visit to learn how you can get your career started today. Still have more questions? To help answer your questions about MyCAA, Martinsburg College has created this Facebook group to help. Eligible military spouse, join now to learn more about the education benefits available to you! Are you a military spouse who has benefited from MyCAA in the past? Share your story in the comments! I am not a military wife, but I am glad they offer this to you!! I think we should be supporting military families as much as we can!! As you guys are there while your hubby or wife takes the ultimate sacrifice! This was very interesting. I am not a military wife either but I think this is great. I hope women take advantage of it.